Microsoft has officially released its new search engine Windows Live Search out of beta, in the hope to compete to search engines that currently leading the packs – Google and Yahoo!. Windows Live Search will also power MSN’s web search in the US. Corporate Vice President of Live Search at Microsoft Christopher Payne said that the launch of Live Search is a significant milestone for Microsoft’s services business, with its core search and monetization platform ready for prime time for MSN and Windows Live as well as for partners through syndication deals. Windows Live Search homepage spots a clean and uncluttered design, with a search query box near the center. From the Windows Live Search page, users can also use Live Search to find and track news, images, video, RSS feeds and blogs online. When mouseover the Windows Live Logo, it will pull down a drop down menu with various Windows Live services. Also include is the link to search or search knowledge on Windows Live QnA. Meanwhile, the Live Local Search includes bird’s-eye imagery, improved mobile integration and functionality, and other user-customization tools. 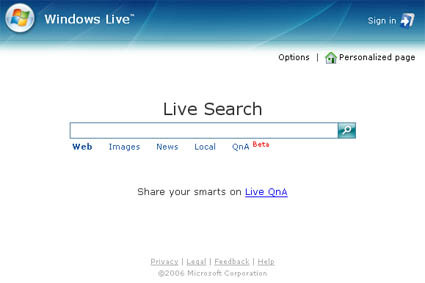 Windows Live Search homepage at Live.com also have personalization capability for users to add Basics, News, Sports and Entertainment pages to Live.com as additional tabs. And users can choose their own preferred language too in more than 30 international language choices. Search the Internet with Live.com Windows Live Search (Now Bing).